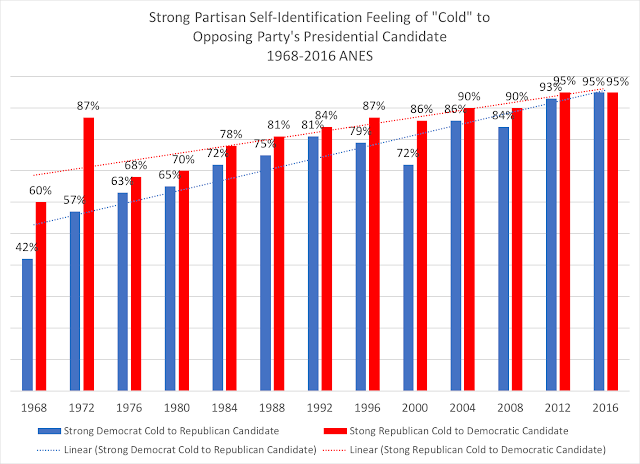 Old North State Politics: In Our Polarized Era, Are We More "Warm" or "Cold" Towards Our Presidential Candidates? 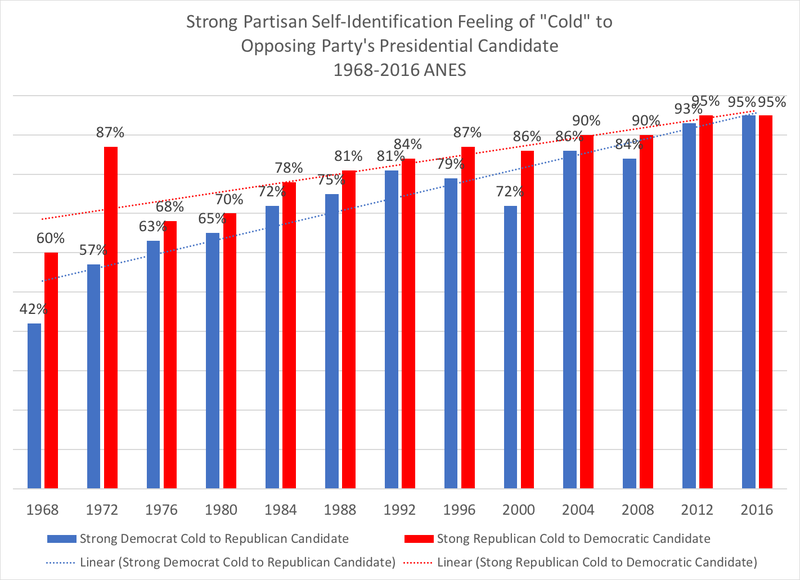 In Our Polarized Era, Are We More "Warm" or "Cold" Towards Our Presidential Candidates? In preparing for a special topics class next year on "Polarization in American Politics," I'm working through a set of books this summer, beginning with James E. Campbell's "Polarized: Making Sense of American Politics." It is a well-written and easy read, both in-depth and broad in its questions and Campbell's answers about polarization in our politics, and fits nicely in my thinking about the course. I'll likely assigned it after the students read Morris Fiorina's "Culture War? The Myth of Polarized America" and Alan Abramowitz's "The Polarized Public: Why American Government is So Dysfunctional," which serve as the "polarized opposites" in the controversy over political polarization in America. "If you don't feel particularly warm or cold toward a person, then you should place (that person) in the middle of the thermometer, at the 50 degree mark. If you have a warm feeling toward (the person) or feel favorable toward (the person), you would give ... a score somewhere between 50 degrees and 100 degrees. On the other hand, if you don't feel very favorable toward a person--that is, if you don't care for (them) too much--then you would place (that person) somewhere between 0 degrees and 50 degrees." 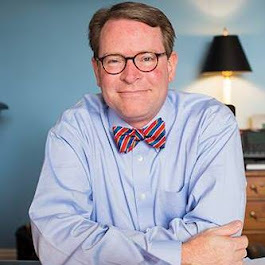 In his study, Campbell uses the ranges of below 59 as "cool" towards the individual and above 80 as being "hotly enthusiastic." But he only cites the 2004 ANES study for his evidence in regards to turnout. As I was reading this section, I thought about whether we would see any trends over time and, if so, what differences there were in the "coolness" or "hotness" by voters and partisan identifiers towards presidential candidates, using Campbell's coding for the feeling thermometers. 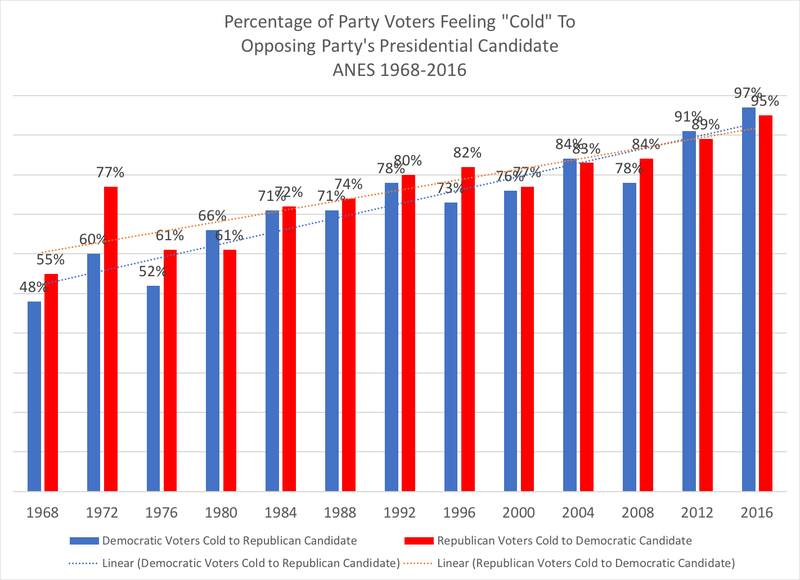 The recently released cumulative ANES studies give us data from 1948 to 2016, so I recoded the feeling thermometers for the Democratic and Republican presidential candidates into the 0-59 "cool" and 80-100 "hot" ranges (used in 1968 through 2016). Then, I took two groups to analyze and compare their responses: first, Democratic and Republican presidential voters and second, self-identification of partisans (those who self-identify as "strong" and "not so strong/weak" Democrats and Republicans) and independents who "lean" to one party over the other. As the above chart indicates, in 1968, 77 percent of Democratic voters (strong, weak, and independent-leaning Democrats) felt "warm" (responding with an 80 or higher on the thermometer) towards their party's presidential candidate Hubert Humphrey, with 68 percent of Republican voters feeling "warm" towards Richard Nixon. But four years later, both partisans saw a drop in their "warmth" towards their party's nominees: Republicans at 63 percent towards Nixon's re-election bid, with only 50 percent of Democrats who voted for McGovern feeling "warm" towards him. Moving towards 2016's election, it is interesting the 55 percent of Democrats voting for Hillary Clinton felt warm towards her, with only 41 percent of Republicans voting for Donald Trump feeling warm towards him. This may reflect what was seen as two major party candidates that didn't necessarily inspire much enthusiasm among the electorate. 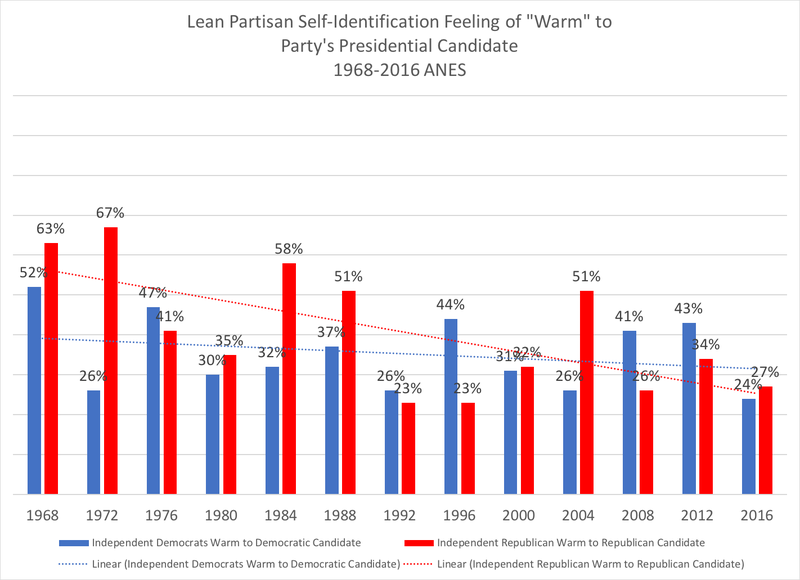 Throughout the past thirteen elections, two interesting trends develop: the dotted lines represent a linear trend line over the time, with both Democrats and Republicans not being "as warm" over time to their presidential candidates as one would think. The second interesting trend runs slightly counter to this overall trend when incumbents successfully run for re-election: Reagan's "warmth" among Republicans rose from 44 to 65 percent, Clinton's "warmth" rose from 41 to 59 percent among Democrats, George W. Bush's warmth rose from 49 to 73 percent among Republicans, and Barack Obama's warmth rose from 56 to 66 percent among Democrats. Interestingly, Nixon's "warmth" dropped among Republicans from his 1968 bid to his successful 1972 re-election bid, most likely helped by the Democrat's implosion of their presidential candidate, as demonstrated by only half of Democratic voters who felt warm to McGovern. 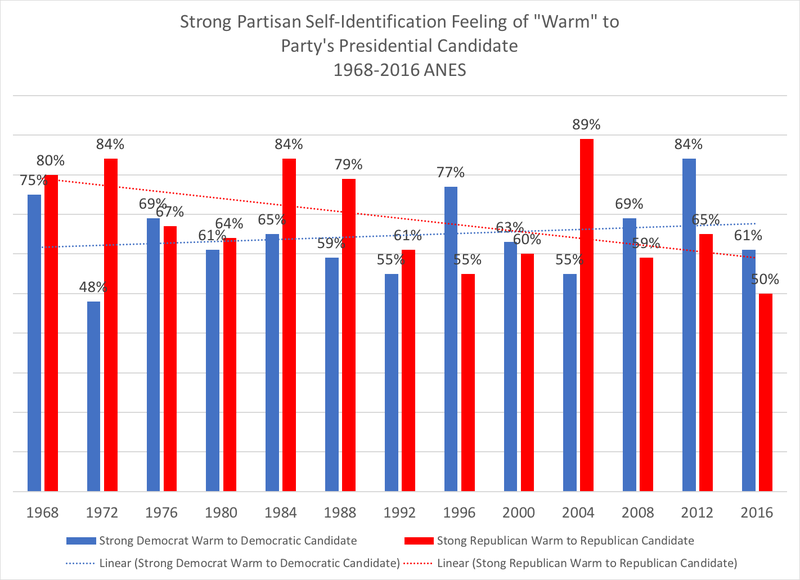 Of the two presidents since 1968 not to have been re-elected, Jimmy Carter's level of "warmth" decreased among Democrats (59 percent in 1976 to 53 percent in 1980), while George H.W. 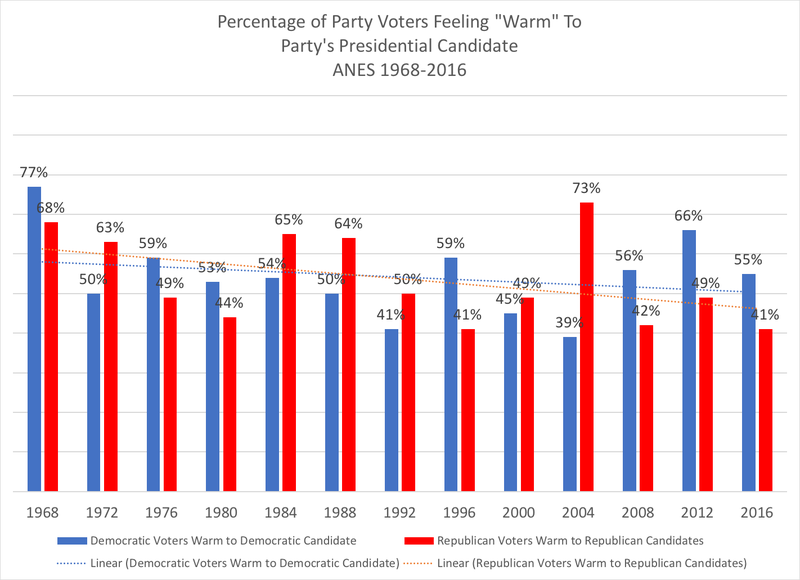 Bush's warmth among Republicans fell from 1988 to 1992 (64 to 50 percent). In 1968, 55 percent of Republican voters were "cool" to Humphrey, while 48 percent of Democratic voters were "cool" towards Nixon. 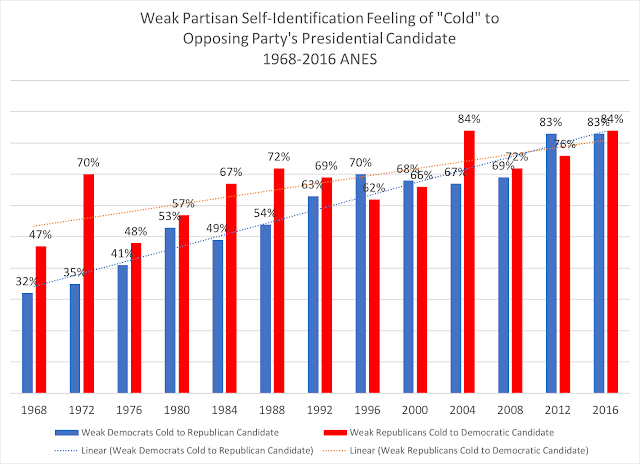 The notable "spike" in 1972 among Republicans towards McGovern is the seeming outlier of the timeline, but the fascinating trend is continually up over the past fifty years: more partisans felt "cooler" to the opposing party's presidential candidate, to where we ended up with 97 percent of Democratic voters registering a "cool" thermometer reading towards Trump, while 95 percent of Republican voters registered a "cool" thermometer reading towards Hillary Clinton. In analyzing the trend lines that showed remarkable consistency and almost parity by the end of the time, the linear trend line for Republicans had an r-squared value of 0.774, while the Democratic linear trend line had an r-squared value of 0.888. 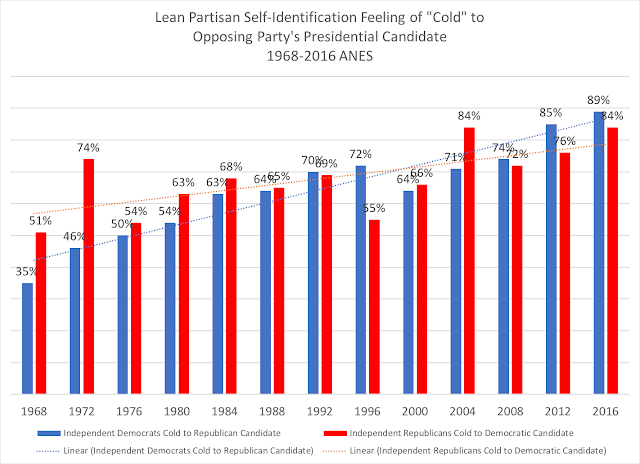 To look more deeply into this, I decided to break out the individual sub-groups of partisan identifiers, starting with those who identified as independent when first asked their party affiliation, but who indicated that they leaned to one party over the other (thus "lean partisans"), and their "warmth" and "coolness" feelings towards their own party's presidential candidates and the opposition. 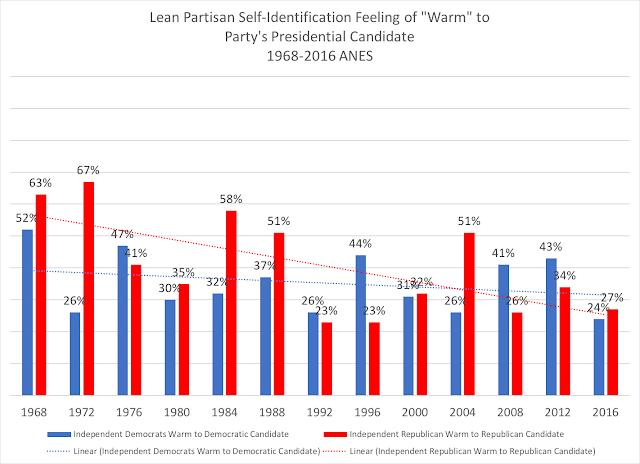 The feelings of "warmth" towards lean partisans' own party and the presidential candidate shows a slight downward trend among Democrats, while Republicans have a fairly larger decline in their linear trend line. The r-squared values for Republicans was 0.42 and for Democrats, 0.06. Starting from 1968's 35% of lean Democrats cool to Nixon and 51 percent of lean Republicans cool to Humphrey, the trend lines (with exceptions in 1972 and 1996 among Republican-leaning independents) show a steady march upwards, with 2016 seeing 89 percent of Democratic-leaning independents cool to Trump and 84 percent of Republican-leaning independents cool to Clinton. The r-squared values of the trend lines are .90 for Democrats and .45 for Republicans. 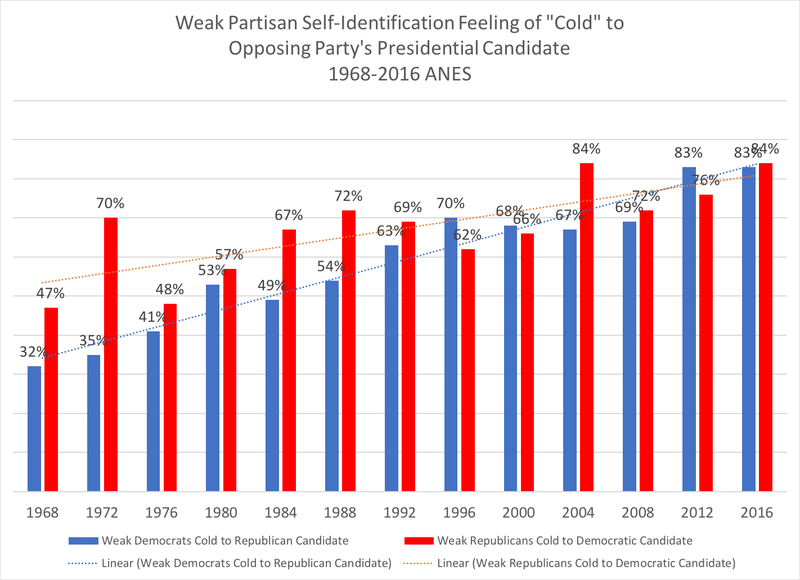 Again, the trend lines point down from 1968 to 2016, where only 24 percent of self-identified weak Democrats felt warmth towards Hillary Clinton and 23 percent of self-identified weak Republicans felt warmth towards Donald Trump (r-squared values were 0.06 for Democrats and 0.41 for Republicans). Again, from a 32/47 Democratic/Republican "coolness" (respectively) to an almost identical 83/84 percent thermometer reading by weak partisans towards their opposition presidential candidate gives us a sense that weak partisans view the opposition in more cool, or perhaps negative, light than they like/are warm towards their own party's candidates. 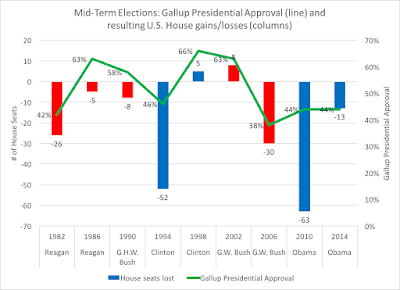 The r-squared values for the linear trend lines was 0.59 for weak Republicans and 0.93 for weak Democrats over this time period. 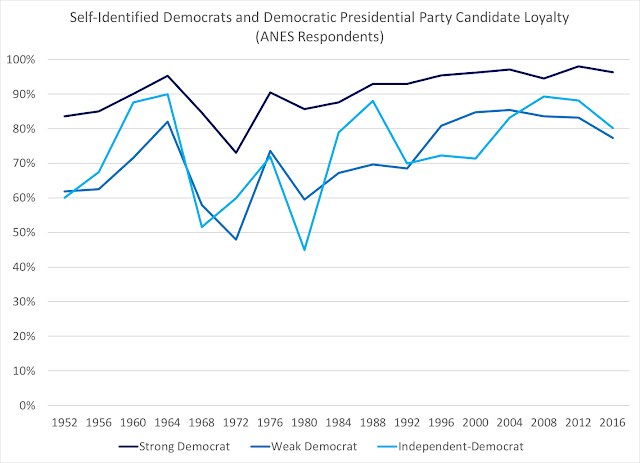 Like the overall population of partisans, the successfully re-elected presidents showed a spike in the percentage of their party's adherents towards them in their re-election bid, much like in the two other categories. 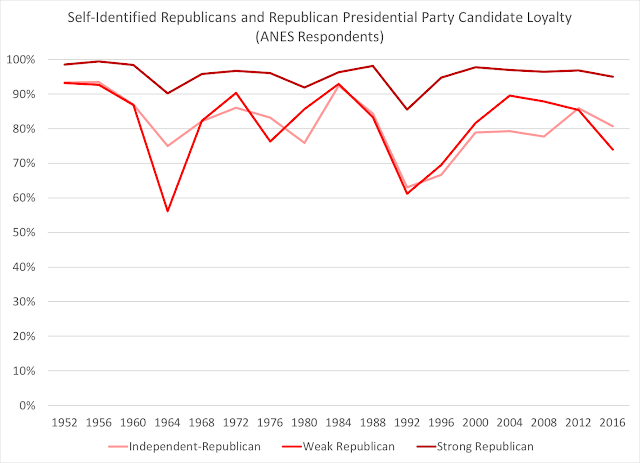 The r-squared values for strong Democrats' linear trend line was 0.04, however, and for the Republicans, 0.26. But based on the "peaks" and "declines" in each party's warmth towards their own presidential candidates, there doesn't appear to be strong trends. Going from a 42/60 percentage of strong Democratic/Republican "coolness" (respectively) towards the opposition to 95 percent of strong Democrats and Republicans cool towards the 2016's opposing presidential candidates is an interesting trend, along with the linear trend lines with r-squared values of 0.70 among Republicans and 0.88 among Democrats. These patterns of "outgroup" partisan dislike line up with other research, most notably the work of Iyengar, Sood, and Lelkes (2012), who found that "partisans like their opponents less and less" when using data through the 2008 ANES survey. Further research by political scientist Lilliana Mason, in her notable recent book "Uncivil Agreement: How Politics Became Our Identity" (which I'm working through now having finished Campbell's book) finds the same trend: "Democrats and Republicans have grown to 'dislike, even loathe' each other, and this emotional partisan loathing is only minimally due to differences in policy opinions" (47). 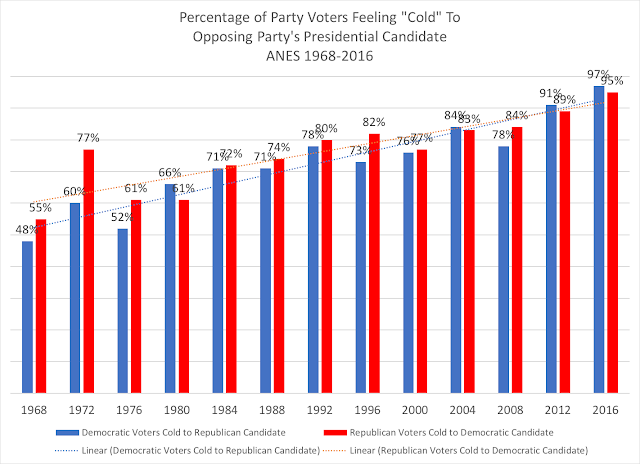 But one would think that these intensely partisan voters would be more warm towards their party's candidates, yet the trend lines don't appear to bare that out as clearly as the cool trend lines. Political scientists are discussing the notion that our polarization could be more based on 'affective' partisanship, namely that it is more about the negativism one shows to the opposition than in support for your own party (a simply idea of "us" versus "them," with the disliking of "them" (the outgroup party) driving partisanship). 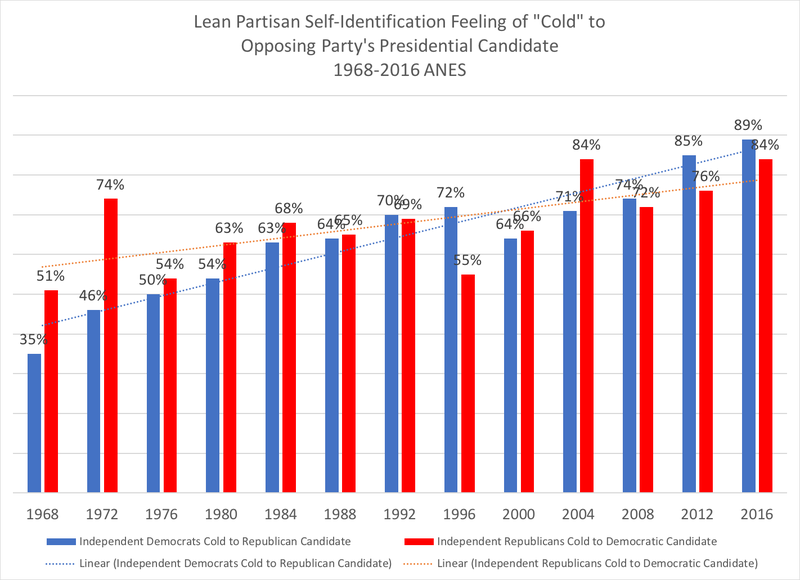 Does "coolness" towards the opposition party's presidential candidate demonstrate this sense of "negativism" within our partisanship and thus polarization? With 95 percent of voters feeling cool towards both Clinton and Trump in 2016, it sure feels that way. Needless to say, there's a lot more reading and analysis to do on this topic, but I found these numbers interesting, to say the least. What I also find is that these trends are disheartening for what it means for the future of our politics: with 95% of both strong partisans disliking the other side, and the other partisans following close behind, I'm not sure where this negative partisanship will end.